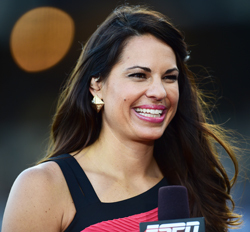 It's 2015, and a first has just occurred: Olympic softball medalist and sports announcer Jessica Mendoza called a nationally televised Major League Baseball (MLB) playoff game between the New York Yankees and the Houston Astros. Calling a game in baseball, particularly in the majors, requires a variety of speaking skills. Not the least of them is a deep knowledge of the game and an understanding of a wide range of situations and tactics that may arise without notice. The ability to speak extemporaneously and with authority requires that knowledge base. A baseball fan myself, I know how nerdy we can get about plays, particularly during a playoff game. And a nationally televised playoff is, of course, broadcast live with a big audience. But the big challenge? Calling a game, at this level or almost any other, has almost exclusively been the province of men. A woman calling M.L.B. games is a rarity. Suzyn Waldman started calling national and Yankees games on television in the mid-1990s before joining the Yankees’ radio booth in 2005. Gayle Gardner called a Colorado Rockies-Cincinnati Reds game in 1993. Michele Smith, also an Olympic softball champion, was a guest analyst for one game on TBS three years ago. And Jenny Cavnar, host of the Rockies’ pregame and postgame TV shows, will fill in this weekend as an analyst on the team’s radio broadcasts. On Tuesday night, she showed her primary expertise in batting analysis, most notably on how the Astros’ George Springer was able to hit a double over Brett Gardner’s head: by standing far back in the batter’s box to react to Masahiro Tanaka’s splitter. But she also did good — and quick — work on pitch selection and outfield positioning. We don't have the entire game calling for you to hear, but the video below offers a sample of the pre-game banter in the booth.